Ukulele Tricks is only a few months old, but I’ve been so blown away by the welcome we’ve received from you all and the ukulele community. I’ve started to make some friends with other ukulele bloggers like Brad from Live Ukulele, Woodshed from Ukulele Hunt, Tim from Ukeeku, and other folks from the Ukulele Underground forums. All these guys have GREAT ukulele websites and have been nice enough to share the word about some of the great resources here on Ukulele Tricks. I thought it would be fun to look back on the year at some of the best posts here on Ukulele Tricks. Many of these posts became great because you all asked questions and made comments. This is what this blog is about… YOU. I want this to be a community of ukulele players that help each other out. So thank you for your contributions, emails, questions, and comments. It’s awesome! With that being said, let’s take a look at some of the best articles on Ukulele Tricks for 2010! 1.) “Hallelujah” by Jeff Buckley on Ukulele – I posted the chords and a cover of Leonard Cohen’s “Hallelujah.” I received a lot of great comments and interest from this. Many of you asked for a followup lesson on the fingerpicking pattern I used for this song and you received! 2.) Ukulele Strumming Patterns for Beginners – In this video lesson, we look at the essential components of rhythm and strumming. If you know these foundational elements, it makes creating your own strumming patterns much easier. 3.) “Somewhere Over the Rainbow” Ukulele Chords – This is probably one of the most popular and sought after songs to learn on the ukulele. Understandably, this post was frequently listed on the left hand column’s “popular posts” category! 4.) 11 Must-Know Ukulele Chords for Beginners – Beginning uke players will find this video lesson very helpful. In it, I show you eleven essential chords you have to know. Surprisingly, you can play hundreds of songs with just these chords. 5.) Ukulele Tuning: How to Tune Your Ukulele – Ya gotta know how to tune your uke up. There is nothing more frustrating than an out-of-tune uke–for you and your listeners! In this post, you’ll learn how to tune your uke, and you’ll also learn about other different tunings that you might not know about. 6.) 3 Reasons Why You Aren’t Getting Better at Ukulele – Do you find yourself hitting a wall with your ukulele skills? Here are some ways you can continue to take your playing to another level. 7.) “Hey, Soul Sister” Ukulele Chords – Up there with “Somewhere Over the Rainbow,” this is another really catchy song that a lot of people want to learn how to play on the ukulele. 8.) Ukulele Sizes: Soprano, Concert, Tenor & Baritone – This is all you need to know about the different ukulele sizes. I will say though that it’s tempting to not want to own one of each when you know about the tonal differences between them all! 9.) Ukulele Scales Explained for Beginners – I’ll be honest. Theory can be dreadfully boring and confusing. However, knowing a little bit can really help you as you learn different songs. This is a great crash course into the theory behind music scales specifically applied to the ukulele. 10.) 5 Great Chromatic Tuners for Ukulele – Tuning your ukulele by ear is a great and really helpful trick, but you will always get more accuracy with a chromatic tuner. Here are my top picks and ones I would recommend if you want the best accuracy at a good cost. This is probably one of the most exciting parts of the year for myself simply because I spent so much time and energy on it. 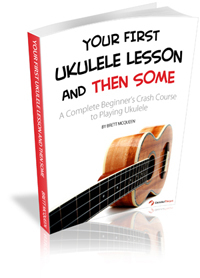 I can’t forget to mention my free ukulele lesson book Your First Ukulele Lesson and Then Some that I released about a month ago. If you’re just starting ukulele or are a beginner, I think you’ll find this book really helpful. I’ve received so many good comments and emails from you all about it. It’s been encouraging to know it’s been so helpful. Check it out if you haven’t already. 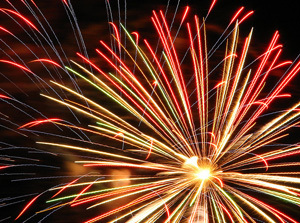 What Do You Want to See in 2011? Right now, I’m working through some more cool ideas for the next year, but I really want to hear from you about what you want to see on Ukulele Tricks. Do you have ideas for lessons or songs you’d like to see? Leave a comment below. I’d love to hear your ideas. Again, thank you all for your enthusiasm for learning ukulele. This has made developing this blog a real joy and pleasure. I also want to wish you all a Merry Christmas and happy holidays! I’ll be doing a lot of traveling here in the next week, so updates might be a bit limited. But after the first of the year, hopefully, I’ll have some more awesome stuff coming your way! I’d love to see additional catchy tunes; and advice/encouragement for amateurs like myself to build a repertoire, play in public/groups, and reminders about what it takes to improve. Memorization is one of my weaknesses — if you’ve advice there, it would be helpful. Great ideas. I think playing public, memorization, and building a repertoire is something we all struggle and wrestle with. I’d like to see more video lessons for classic or traditional songs with tabs. Preferably either with the full music above it or if it’s just strumming then have it split into bars or have the number of strum patterns played for each chord. The fiddly bits could be explained in the videos. I’d also like strum techniques tutorials, especially how to sound Hawaiian, and not just the standard down down up up down. A page of standard chord progressions would be useful too. Also some more advanced pieces with a mixture of strums and picking. Something to really get stuck into. I’m asking a lot I know but any of the above would be appreciated. Karl, I love the ideas! I will definitely try incorporate some of your suggestions in some way on the site. Thanks so much for your feedback. I have recently revived my interest in the ukelela a would recommend a clip on tuner. Very easy to use. Tells you whether tuning is high or low When your uke is tuned correctly, the screen turns green. The one I have was purchased from my local music store and cost around £18.00 sterling. A worthwhile investment. Great recommendation. Do you know what company makes the clip-on tuner you are talking about? Yes indeed. The ukelele tuner is made by Tanglewood and called a Traffic Light Tuner-TCT1. I hope this helps fellow ukelele players. On the subject of building a repertoire of songs and for those who have not yet visited. There are a vast number of songs on the Dr.Uke website. With chord charts and note names above, it is a real treat for beginners and advanced alike. I have wore down my strumming fingernail (index) and decided to use a pick to give it time to grow back. Are there any hints for using the pick? I’ve never used one before. It wasn’t a problem until I started playing the baritone. It seems to wear down the fingernail down much faster. I have a couple of plastic picks that came with some ukulele accessories I ordered. I also have an Alaskan Pick that I’ve filed to be just beyond my finger pad. That doesn’t involve holding but it doesn’t feel that comfortable since it needs to be tight enough to stay on when I strum. Hi Shirley, if you’re going to use a pick (which I don’t particularly prefer the sound of), I’d recommend looking at felt picks. These are made a little thicker and sound nice and warm against the strings. They might be easier to hold. When I hold a pick playing guitar, I typically hold it between my thumb and index finger. Keep a loose, relaxed grip just enough so the pick doesn’t fall out of your fingers.